Shirayuki, why are you so special and so loved by everyone you meet? This is the question I cannot help but ask with each episode I watch of this anime. The specialness of this very bland, boring, ordinary girl with a supposedly unusual hair color just goes way too far. If I'm not feeling it, then why are all of these idiots in her world? Those who claim this anime sidesteps the usual shoujo anime tropes couldn't be more wrong. It falls awkwardly and unawares into most of them and sloshes around in the ditch water like a pig wallowing in its own filth. We have a very cliched protagonist, Shirayuki, who is the Mary Sue of anime. First, she has a very unusual name in any culture, "Snow White." If that doesn't scream "Mary Sue," then I don't know what does. Second, she has a rare hair color for NO story reason in order to force her to be considered special by the other characters, but it doesn't convince the viewer who is not impressed with this unrealistic display. Third, she is so special, the prince of her own kingdom wants to make her his concubine, but she decides to flee the country instead, only to run into none-other than the SECOND prince of the neighboring country. A coincidence for you, and one coincidence for YOU---coincidences for everybody! But, wasn't Shirayuki escaping a horrible life when she ran away from home? That's why she ran, right? Well, no. In fact, she was very well loved by everybody in her own kingdom and she literally threw it all away simply because Prince Raj got horny and decided he wanted to pamper her like a wife without actually marrying her. I'm not saying this is okay, but there are worse fates out there. So, now she's in the kingdom next door as the very special friend of Prince Zen, a young second prince she meets immediately upon leaving her own kingdom. Because she had already worked as an apothecary, she took naturally to this whole herbs business and easily passed the test to become the palace's apprentice herbalist. Well, nothing's hard for this girl, other than being so beautiful and revered. Life is hard, indeed. And, that's just the problem. There really is nothing about Shirayuki's life that is a problem. She was happy before and she is happy now. She was pretty before and she is still pretty. She was hardworking before and she is hardworking now. She stood up for herself before, and she does it now, too. What is the point of even watching this anime when the story is nonexistent and she has so little conflict in her life? It comes off like a wish fulfillment fantasy that gets so carried away with making the protagonist's life perfect, it's BORING AS HELL. There is no character development whether in Shirayuki, Zen, or anyone. You cannot have meaningful anything or anyone if you have nothing at stake. There is nothing at stake here, and it is a story about a really fortunate girl, with perhaps a bit too much fortune, finding a very fortunate love match. Perhaps this would be more interesting if there was some struggle and some real growth in Shirayuki and Zen, but it doesn't exist. Watching this can be a way to pass the time if you're bored, but I found myself becoming bored while watching this. If a story about everyone getting along with everyone else and only having to deal with minor misunderstandings sounds like a blast to you, then dig in. I ain't got no time for this lightweight storytelling crap. Roses, tomatoes, and human blood. What do these all have in common? If you guess their color, then you would be correct. A certain girl with noticeable red hair also exists in a fantasy world where the colors of red decorates its colorful storytelling. Akagami no Shirayuki-hime (Snow White with the Red Hair) isn’t exactly a Disney tale where there’s just prince charming or Cinderella shoes. Rather, this show is what I’d envision as a unique fantasy story of vibrant coloring. Adapted from the manga of the same name written and illustrated by Sorata Akizuki, the series focuses on a young woman named Shirayuki. She is born with her trademark red hair that catches the eye of almost anyone she meets. This unfortunately attracts the attention of a prince named Raji who wishes to marry her and in response, Shirayuki attempts to escape from the country. She later meets a young man named Zen and helps him with an injury. As prince Raji attempts to find Shirayuki, we see how her adventure begins not as a heroine who is on a mission to slay dragons but to obtain a rightful place in the world where she belongs. The series is noticeable that it’s a split cour (12 episodes) each. This review will cover the first cour of the adaptation by studio Bones. As a fan of the manga, I was ecstatic to see that this anime adaptation became a reality. To get straight to the point, Akagami no Shirayuki-hime is a very classic fantasy. It takes place in the Kingdom of Clarines that is highly decorative. In fact, its first few episodes will make you see the world fiction that Shirayuki and the others are part of. Even the very few first scenes of the show will unravel what may be expected. The highly decorated castle, the scarlet red haired heroine, and a prince with a commanding presence all bring out the atmospheric shoujo setting. The premise also includes a poisoned apple which is a classic plot device used in the original Snow White story. But rather than Snow White being saved, it’s Shirayuki who does the saving. In essence, Shirayuki is an antithesis of the damsel in distress trope. She is courageous, intelligent, daring, and very compassionate with the people around her. She helps a stranger (Zen) with little hesitation and often puts others’ will-being above her own. What defines her as a strong woman also makes her independent as she relies on almost no one to achieve her goal. And in this story, her goal is to become a professional pharmacist. The show executes its storytelling from many angles. The most prominent would be the relationship building between Shirayuki and Zen. The two already have a charming chemistry with their moments from the very first time they’ve met. Zen’s curiosity of Shirayuki is also interesting to see as he wants to know more about her each episode. Their social status in the show contrasts greatly but it’s shown that they are similar in a variety of ways. Both are confident in their abilities, skillful in certain arts, and often uses clever thinking to solves problems. They are also both sometimes stubborn with certain objectives such as when Shirayuki stood in front of a sword while risking her life to get a point across. Furthermore, it’s also shown throughout that Zen has grown fond of Shirayuki to the point that he sometimes feels dependent of her. In return, Shirayuki often looks after his well-being while developing a mutual respect for one another. And given the shoujo fantasy premise, there’s little doubt that romance soon blossoms between the two. As a character driven story, the series also puts emphasis on the other people that we see. The two most noticeable are Zen’s aides, Mitsuhide and Kiki. The two has a strange relationship although it’s shown that they very close. Their sense of loyalty is also unparalleled each episode as they are willing to put their lives at risk to help Zen. Although we don’t learn much about them, it’s shown that they’ve also grown quite fond of Shirayuki’s presence. Other characters such as Obi makes the audience wonder what they may be capable of especially with what they make of their first impressions. Lastly, there’s also a bit of sibling drama that occurs in the show. Zen’s brother is shown to be manipulative individual who is hard to read; sometimes he is serious, other times he is playful. The siblings’ relationship often creates tension whenever they are on-screen together and it really makes the audience curious to see how their relationship develop in the present story. For Shirayuki’s role, she undertakes challenges to prove herself as a capable pharmacist. While the show is predictable, it still manages to capture the interest of the viewers as we see how she is able to take on different challenges. The experience she shows in the series isn’t just by the actions she does but by how she does them. It’s interesting to note that Shirayuki’s confidence comes from willing to help others as a goal to become a pharmacist rather than just earning money or achieve fame. Her selflessness combined with courage and independence makes her stand out as an inspiring heroine. While the series is very appealing, this might not be a show for everyone. For starters, this is not to be taken as an action theater. In other words, do not expect epic sword clashes, war drama, or political affairs that spans into complicated plot angles. Instead, this is more of an inspiring fantasy shoujo that classifies the characters and how they progress. The relationship dynamics makes this series very colorful while retaining the strengths of a classic shoujo. I do have to admit that not everything is captured by source material adaptation standards. Also at times, the story’s pacing feels sluggish in particular with the first few episodes. There’s also some forced comedy that occasionally appears although this can be neglected by the memorable dialogues. A fantasy adventure like this isn’t also without romance so expect some obvious direction that the story follows up with. Despite this though, the show itself stands alone as something unique. It’s not a reboot of Snow White but a colorful tale of red. As one of several Bones’ series to premiere in 2015, Akagami no Shirayuki-hime is a powerhouse when it comes to visual arts. The show’s animation features vibrant colors combining elements of resourceful landscapes, architecture, and character designs. The Kingdom of Clarines is also shown to have fantastic features that is fitting for a grand castle along with its neighboring town. Shirayuki’s red hair is decorated as unique throughout the season. Her outfit gradually changes as her skill evolves and reflects on developed experience. Zen’s outfit is also fitting for someone with the status of a prince and alongside his aides, they make up a memorable trio. There is also virtually no fan service as the show makes its point to unravel Shirayuki as an independent heroine, a female character that doesn’t need to rely on looks to gain others’ attention. All things aside, I do have to admit that there are occasionally some sluggish animation issues with the character movements. However, the body language in the show is undeniable when it with ‘a picture is worth a thousand words’ moments. The word I’d describe the music for the show would be sweet. It’s lighthearted that isn’t hard on the ears but instead convey its fantasy shoujo feel whenever it needs to be. The OP/ED theme song are decorative and well connected to its atmospheric setting. Character voice mannerism comes from the strengths of the main leads. Shirayuki shows a lot of personality in her voice that shifts from confidence, humorous, and daring when she needs to be. Similarly, we also have Zen who displays a familiar nature as a prince. His voice sometimes does display inklings of stubbornness and even arrogance when interacting with his brother. That actually brings up to a good point as well. Izana is probably a character that I’d describe as the most hard to read yet. Just judging on his voice alone, there’s a lack of trustworthiness in his character. But overall in terms of character voice mannerisms, the whole cast is well portrayed. So what else is to say about Akagami no Shirayuki-hime? It’s more than a tribute to the original Snow White story. We get a colorful cast of characters in a world where possibilities can become a reality. The show does a wonderful job when crafting its premise while staying true to it throughout the season. The character relationships are some of the key highlight points that makes the show worthy of its praise. And when it comes to its technical features, the series is a red scarlet eye candy of fantasy. In retrospect, Akagami no Shirayuki-hime makes you feel attached to the characters, story, and become a part of something almost magical. There are anime series which excel because they have an original story (Clannad After Story, Stein's Gate and Madoka Magica) and there are those which soar due to well-written characters who carry an otherwise generic story. Akagami no Shirayuki-hime may be dismissed due to its straightforward nature which seems to religiously follow the shoujo genre but a deeper look reveals its characters that defy the tropes which makes it special. The legitimate weakness of this series is that its story does not stand out. We were introduced to Shirayuki, a girl who ran away from her home because their prince wanted to make her a concubine then she met Zen, a prince from another country. The premise basically rings a familiar trope that was used too many times before (Disney, anyone?). The first episode is very fairy tale like in my opinion with all the events being mirrored with the first few events of Snow White. We then follow her life and struggles after she made friends with the Prince. In all honesty, it can be tiresome at times since the first few episodes were made to look as if she was a princess in damsel and the prince has to rescue her just at the right moment. Other moments involve Shirayuki taking an exam, being introduced to Zen's brother and so on but again, the story does not stand out which is a fair claim to naysayers to dismiss the series as just another shoujo show. This hurt the series considerably in its not so stellar episodes and might leave a stagnant feeling to the viewers. DISCLAIMER: My praise to Akagami Shirayuki-hime begins here and it might border as if it came from a rabid fanboy but I will try my best to balance my review. The artwork is highly consistent courtesy of Bones and is the prettiest looking series this season. It was as if the staff borrowed some of Shinkai's technique (the man behind 5 Centimeters Per Second) when it comes to the relaxing hues used in Akagami Shirayuki-hime. The artwork (lighting and the characters' expression) was also able to accentuate the heartwarming scenes in this series (Episodes 4 and 11 in particular) and along with the standout score, it elevated an otherwise generic moment. As regards to character designs, these were cleanly made and these faithfully followed the mangaka's but modified them a bit to have a Bones feel to them. These also mark a departure from your typical shoujo fare where the typical characters are so pretty that you might be dazzled. Again, Bones is not a stranger in putting the right music at the right moment which makes the effect of crucial scenes in this series very potent to those who invested their time in it. Strings were used during climactic ones which elevated nondescript scenes to heartwarming events. It also knows when to stop during the show's most crucial moment (I am not going to spoil anything) to emphasize something irreversible with Zen and Shirayuki has happened. For most of the time, the musical score is relaxing enough to complement this languidly paced series which is a very commendable job for Bones. 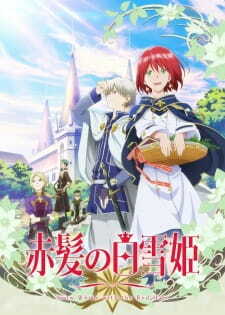 Akagami no Shirayuki is a character driven show which has actual and relatable characters and a very strong lead reminiscent of Akatsuki No Yona. For what the story lacks, the characters in this show compensate. Shirayuki defies the traits of a typical shoujo lead. She is socially capable, strong-willed, is not afraid to speak her mind and has actually has a brain which knows her limits. A viewer might expect a typical shoujo lead to go doki doki with her love interest but Shirayuki holds her own and yearns to seek position for her to see Zen as her equal. A crying main character trope because she was intimidated is also not present here but we are given a very rational one who thinks before she acts. Zen, on the other hand, might err at times to your typical male shoujo character but a closer examination reveals that he is not. While he is kind, his past (a very painful one, mind you) reveals what made him like he is as portrayed. He might be likable and composed but his insecurity (or whatever that feeling is) to his much superior brother is palpable and shows its ugly fang when triggered but not to the point that he shows angst about it. He also narrowly avoided the sparkly main lead syndrome by toning down some of his traits and by not giving him a chick magnet role. All other recurring characters were also given ample time to get some development. Mitsuhide and Izana benefited from Zen's flashback of his past so much that it can be also viewed that certain story was theirs and not Zen's. They were also elevated from plot device to actual characters which interact with the leads (and contribute to their future paths) without the feeling of emotional manipulation. Izana in particular might just be my favorite character in this show for his reasons and his peculiar ways of handling problems which antagonize him a bit. Obi, on the other hand, is a very interesting oddball which complemented Zen's calm nature. He is quite perceptive and throws statements which drive the series to a positive direction. The confession scene would not have happened without him after all. If you are a shoujo junkie and are looking for shoujo-esque moments every single episode, then I am sorry that you are looking for the wrong show. There are no overly complicated relationship webs (A likes B who likes C who likes D... yada... yada...) and we are only given focus with Zen and Shirayuki for as long as the shoujo nature of this show in concerned. You will also not see Zen getting doki doki around Shirayuki (vice versa until the climactic moment in this show) just because it's the genre's trope. A crying lead being submissive to her love interest after an unfortunate event is also missing here. Instead, Shirayuki has her own resolve in the show's larger problems. The main leads also prove that we don't have to go for two seasons of confusion and misunderstanding to get a very satisfying confession in the end. And boy, what a satisfying event that was. There are episodes which fail to copy the oomph of the series highlights (Episodes 2 and 5 in particular can be erased and it will be better in my opinion) but I expected a generic love story upon hitting the play button. Then my prejudice in this show was destroyed in the first episode. This is how execution can make cliches to something special. A second season is coming in January which I hoped will live what makes this one a good romance title. This review will not contain any spoilers regarding the series. Akagami no Shirayuki-hime's story is straightforward and simple, it's concept and how it is formed is something that is very common with the demographic that it resides in. So in that regard, it is not something that has not been seen before. Despite it being so simple and straightforward, it gives the feeling of being magical and soothing. How the events unfolds towards the character is incredibly seamless. While it may follow the specific tropes that come from the demographic, it tries its best to either break the trope and become surprising or execute it in a way where it is appreciated. Many people may hate the 'damsel in distress' trope, but this series tries its best to avoid it, as much as the synopsis/first episode gives the impression of it occurring, the continuity of the series avoids it. As the name of the show suggests, the show tends to give a feel of it being a Disney movie. It's charming, fuzzy and cute to watch through. The story is definitely light and focuses more about the dynamics of the characters, and how their relationships progress through the events that approach them. The art and animation of the series is incredibly exquisite. As expected from a studio that is well known for it's gorgeous visuals, Bones. It does not follow the usual colorization that someone would expect from this type of show. Yet it fits it perfectly. The colors are bright and the animation is slick smooth. It is easy to distinct between the characters and it highlights everything. The visuals are consistent throughout the entire series without a hint of drop in quality. Surprisingly, the visuals compliment the series atmosphere, considering how warm the content of the series is. In this situation, the visuals play a factor in the enjoyment of the series, since it visualize everything that is needed. The opening and ending themes are not my favorite, but they're fine. They're not bad or amazing. They don't feel out of place, the sound is something to be expected from the type of show this is. On the contrary the soundtrack for the series is fit and light. It does not overwhelm the atmosphere that the show is trying to represent. It does not stand out, but I'm under the belief that it is intentional, considering that it is not the type of show that the music should take the spotlight. It's only more evidently used in scenery focus moments to capture the feel of the place. The relationship between the characters is what this show is all about. Or well, to be more accurate. It is what makes the show special and great to watch. Shirayuki is a fresh of air from the usual heroines that are commonly in this type of demographic. She's very clever, independent on what she does and holds responsibility of what she does and try to repay any favor that she may hold to anyone. She is not there to be saved and protected for romantic moments, she holds her on and tries her best to be in the same line as the male main lead. Her boldness and ability to solve situations on her own is nothing short of amazing! The same falls for other characters. Most of the characters showed how multidimensional their characteristics are instead of being one dimensional characters. Character developments are thankfully still open for the continuation of this series,. Akagami no Shirayuki-hime is an anime that is incredibly easy to watch through. It's light and warm as I have mentioned previously. The interactions between the characters are interesting and the dialogue rarely leaves the person to be bored or feel that it is being dull. It may have it's moments that feel "cheesy" on book, but the way it is approached is what makes it gorgeous and beautiful to watch. If you're fan of the shoujo demographic and the Disney-like settings, with a strong-willed heroine, then this show should be right up the alley. Thanks for reading this review, any feedback is appreciated on my profile!